( Newton, NC - - July 17, 2010 ) After several afternoon rain showers, the clouds parted and the track was dried as drivers from the NASCAR Whelen All-American Series hit the asphalt for Advance Auto Parts Night at the Races. The Bojangles Late Models, the Advance Auto Parts Limiteds, the Everything Attachment Super Trucks, the Hickory Street Stocks and the Red Baron Race Parts Hobby Stocks all made appearances, putting on a spectacular show for the fans in the grandstands. The Bojangles Late Models took to the track for a special 100 lap feature that brought the crowd to its feet when the No. 10 of Andy Mercer grabbed the checkers as an intense battle between the No. 51 of Josh Wimbish and the No. 92 of Candace Muzny ensued. A light rain shower fell just as the Bojangles Late Models lined up for their special 100 lap feature. The rain caused a slight delay in the action, but the cars eventually made their way onto the track for 100 laps of fast paced racing action. The No. 10 of Andy Mercer was anxious to get the feature started, as he brought out the first caution after jumping the start of the race. The No. 43 of Jesse LeFevers and the No. 7 of Ashley Huffman kept the excitement rolling as they bumped into each other heading out of turn four. Both drivers were able to hold on tight and save their wobbling rides as they headed down the front stretch. By lap 18 the No. 2 of Ty Dillon worked his way into the top five from his seventh place starting position. The second caution fell on lap 22 after LeFevers experience mechanical issues that brought his ride to a halt on the back stretch. A third caution fell during the restart after the No. 92 of Candace Muzny and the No. 7 of Ashley Huffman connected heading into turn four, sending Huffman hard into the outside wall. The impact with the concrete wall caused major damage to the front right side of Huffman's ride, breaking off the front tire, bringing Huffman's night to an early end. Muzny, unharmed in the lap 22 incident proceeded to make her way through the field. Muzny captured the fourth place position on lap 25 and continued on to take over third on lap 34. As Muzny worked her way through the field, a battle began between the No. 5 of Dexter Canipe Jr. and Dillon for fourth. Dillon passed Canipe Jr. on lap 34 for the position, but Canipe Jr. stayed tight on Dillon's bumper searching for an opportunity to maneuver around him. Finally, on lap 46, Canipe Jr. slid under Dillon heading into turn four regaining the position. Muzny continued to charge towards the front grabbing second from Mercer on lap 53. On lap 59 Muzny tapped the No. 51 of pole sitter Josh Wimbish as they headed into turn four, scooting Wimbish out of the way for her to take over the lead. Mercer decided it was time to make his way to the front, driving by Wimbish taking over second place on lap 64. The No. 88 of Kyle Mansch made an appearance on lap 72, breaking into the top five after starting mid-pack in an unfamiliar eighth place. With 25 laps remaining Mercer began closing in on Muzny using the high line to try and work his way around Muzny. By lap 79 Mercer made his way into the lead, leaving Muzny to ride around second. Just as Mercer took over the lead, the fourth caution waved for debris on the track. The fifth caution of the night came out on lap 84 after Mansch, spun around heading into turn four due to slick track conditions from a light mist that began to fall. The sixth and final caution waved as the field went back to green flag racing after Muzny jumped the restart. Muzny and Wimbish battled the remaining laps for the second place position running side by side for several laps, until Wimbish inched ahead on lap 94. Muzny wasn't going down without a fight, as the two cars came to the finish line side by side. It was Wimbish who would prevail and be credited with the second place finish behind Mercer, leaving Muzny to come home third. 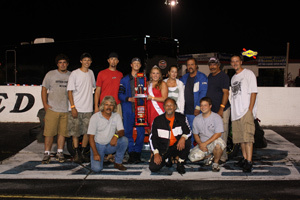 Canipe Jr. and Mansch completed the top five respectively. Rookie drivers of the Advance Auto Parts Limiteds were on the move during the 35 lap event, as the No. 12 of Austin McDaniel and the No. 11 of Matt Piercy maintained a tight battle for third during the first five laps. McDaniel captured the position on lap five, leaving Piercy and the No. 97 of Brandon Lynn to compete for fourth, with Lynn taking over the spot on lap seven. Lynn was on a mission as he set his sights on McDaniel and the third place spot. McDaniel put up a hard fight until lap 16 when Lynn took over the position. The first caution fell on lap 18 after Piercy got into the back of McDaniel heading into turn four, sending McDaniel for a spin, causing both drivers to restart in the back of the field. On lap 21 Lynn began to close in on the No. 07 of Tyler Church, who occupied the second place position. Lynn looked for an opportunity to take over the spot, grabbing the position on lap 23. A second caution fell on lap 33 after the No. 66 of Travis Byrd and the No. 09 of Kenneth Pardue connected heading out of turn two sending Pardue spinning. Caution number three waved after Lynn jumped the restart. On the final lap, as the field headed into the first turn, Lynn got into the No. 5 of pole sitter and race leader Dexter Canipe Jr. The impact sent Canipe Jr. for a spin and brought out caution number four. As the field went back to green flag racing the No. 13 of Dakota Slagle and Pardue got together causing a chain reaction of cars to pile up, sending Byrd and the No. 03 of Russell Stillwell spinning on the front stretch, bringing out the fifth and final caution. A green, white, checker finish was called with Church leading the field. Church brought the field to the checkers with McDaniel, Piercy, Slagle and Pardue in tow to round out the top five. The No. 69 of Trevor Hignutt put on a clinic during the Everything Attachment Super Truck 35 lap event, as he jumped into the lead on lap three, taking over the position from the No. 11 of Thomas Beane. During the first five laps the No. 16 of Clint Fields and the No. 7 of Justin Crider created an intense battle for third place. Fields began to pull away on lap seven and began looking for a chance to take on Beane for the second place spot. Fields managed to work his way around Beane, moving into second place on lap 14. The first caution fell on lap 15 after the No. 33 of Jeremy Birch and the No. 6 of Brandon Setzer connected heading into turn two. Beane and Crider fought over the third place position at the restart. Crider utilized the outside line to move around Beane capturing the position on lap 18. With ten laps remaining Crider began to inch in on Fields as he searched for a way to move into the second place spot. The second and final caution fell on lap 28 after the No. 15 of James Krikham went for a spin on the exit of turn four. With five laps to go Setzer pulled under Beane and began to challenge for fourth place. 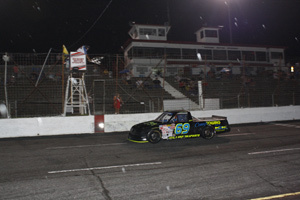 Setzer moved into the position with three laps left in the race. As Hignutt led the field across the finish line, Setzer went for a spin in turn four allowing Beane to get by him and regain the spot. Fields, Crider, Beane and the No. 05 of Kyle Wilson completed the top five. The No. 21 of Roger Pitts III jumped into action during the Hickory Street Stock 30 lap event, by moving into the second place spot by lap three from his fourth place starting position. Pitts III charged on taking over the lead on lap nine, leaving the No. 9 of Charlie Watson to battle the No. 1 of Taylor Stricklin for third. The battle between the two drivers continued until lap 12 when the two connected as they headed into turn four sending Stricklin for a spin, bringing out the first and only caution. Drivers continued to swap positions back and forth beginning with the No. 64 of Marshall Sutton taking over the second place spot from the No. 03 of Kevin Eby on lap 12. On lap 14 the No. 51 of Dustin Walker took over third sending Eby back to fourth. Eby quickly regained the position, pulling back into third on lap 17 as he set his sights on Sutton. Eby didn't waste any time moving back into second place, as he slid under Sutton on the exit of turn two on lap 20. Stricklin and Watson continued to work their way up through the field after being sent to the back of the pack, due to their involvement in the race's only caution. 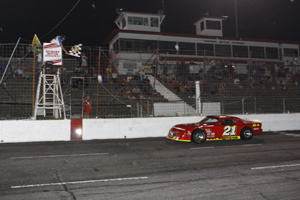 Stricklin had made his way to the fourth place spot on lap 21, while Watson moved into fifth with five laps remaining. Pitts III led the field to the checkers with Eby following closely behind. Stricklin managed to maneuver his ride into the third place position on the final lap, leaving Sutton and Watson to duke it out for fourth. Watson proved the victor of the duel grabbing the fourth place finish, allowing Sutton to come home with a solid top five finish. The Red Baron Race Parts Hobby Stocks brought Advance Auto Parts Night at the Races to an end as they hit the track for their 20 lap race. The No. 28 of Casey Pierce jumped into the lead as the green flag waved, bringing the No. 19 of Chad Pressley along for the ride. Pressley spent one lap in second and quickly moved out front capturing the lead on lap two. As the field headed out of turn four on the second lap, the No. 85 of Jeff Weisner bobbled in the corner allowing the No. 88 of Andy Towery to get around him to take over the third place position. The first and only caution fell on lap three after the No. 29 of Paul Pressley spun out in turn two. By lap four Weisner had made his way back into the top three, but pulled off the track on lap 10. 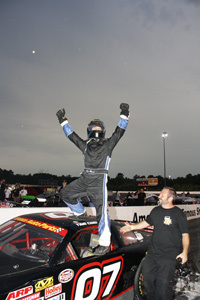 Chad Pressley brought the field to the checkers with Pierce, Towery, the No. 13 of Dean Slagle and the No. 31 of Steven Willis to finish out the top five. 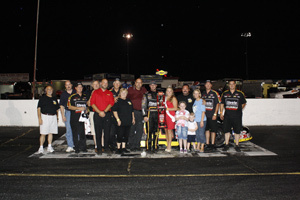 Saturday, July 24 th is Paramount Automotive Group Night at the Races featuring the NASCAR Whelen All-American Series. The event will include appearances by the Bojangles Late Models, the Advance Auto Parts Limiteds, the Hickory Street Stocks and the Hickory 4-Cylinders. Grandstands open at 5 PM, with qualifying immediately following. An On-Track Autograph Session will take place at 6 PM with feature racing action beginning at 7 PM. Visit your local Paramount Automotive Group dealership for a complimentary ticket to the event, free tickets are available while supplies last. Tickets at the gate are only $10 for adults, $8 for teens and seniors, $5 for kids ages 7-12, with kids 6 and under FREE. Remember if you not here… you're missing out! Qualifying for remaining divisions was canceled due to rain. Drivers were lined up by points. 4. (5) Dexter Canipe Jr.